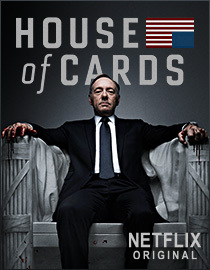 With the Netflix release of their entire 13 episode first season of HOUSE OF CARDS today, it opens up solid discussion on many levels. The biggest buzz is related to the mere fact that they are making all of the episodes available from day one. There’s grumblings about spoilers and the effect on social media. In the end, Netflix is being quite smart about releasing all in one day, but it’s not all that groundbreaking. Hopefully, its how they treat it after the release that’ll be groundbreaking. We’ve seen all episodes of a season released before in a show’s Home Entertainment window, but those episodes had already aired. We’ve even seen marathons on cable networks to entice new viewership – I’ve even picked up some current faves through that sampling – but, again, its all old content. What is different is that the larger release is all new original content. So, what can Netflix glean from having everything go out at once? Netflix should be tracking all of the outgoing and incoming information. Whereas other shows with breaks between airings can not attribute exactly what caused drop-off in viewers (and takes 2-3 weeks to start getting the data to figure it out.) Netflix will be able to see how people like t by how quickly they get into the next episode. They’ll even know what times of the day their marathon-style viewing occurs. If they’re smart, they’ll be able to draw conclusions about viewers and what types of shows to suggest based not only on genre preferences, but on the “marathon” ability. Some people just like to binge view. Some like to spread it out and have something to look forward to. And some people can only view in holes in their schedule. Netflix will be able to garner deep insights that they might not have been able to before because they never had a case-study based on exclusive original content viewing. Soon enough, they’ll have a strong enough sampling to determine quickly whether the show warrants another season order. How many creatives in Hollywood would love to have the opportunity to know the viability of future seasons as quickly? Where it used to take 4-8 weeks of a season to truly know if you’ve got a hit, you could know in a week if the sampling is there. While Hollywood Reporter’s Tim Goodman shares his concern about how social media might unleash inopportune spoilers, we’re already at risk due to DVRs and the time shifting of our favorite shows. If people haven’t figured out how to shield themselves, it probably doesn’t matter to them anyway. Looking more deeply at social media, Netflix should look to glean as much information as possible from when people are tweeting or posting. This “controlled” release environment provides further opportunities that just don’t usually exist when releasing shows, movies, whatever. To be able to review social to see when the most chatter happens by episode or time of day or completion – when you know the exact release for everyone is invaluable. As Netflix is doing something new in this controlled environment, it allows them to delineate best practices in a way that traditional television cannot. Whether traditional TV viewing is disrupted by news, sporting or natural events, there are always variables that are hard to pin down when pondering why viewership may have vacillated. Kudos to Netflix not for trying something new, but providing the opportunity to truly garner insights that can help not only HOUSE OF CARDS, but all of their programming (and ours) in the future.